PDF to Word OCR Converter is main converting tool. So you need to download its installer firstly from this link: http://www.verypdf.com/dl.php?file=verypdf2wordocr.exe. Then, you need to follow setup wizard after you double click this installer on your computer, finally PDF to Word OCR Converter can be installed successfully. After basic setting, if you want to produce Word file from scanned PDF file right away, you can click “Convert” button on interface of PDF to Word OCR Converter. 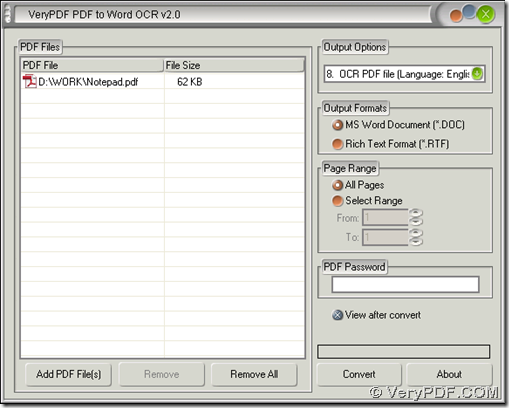 Then select a folder in dialog box of “Save As” , and click “Save” there so that PDF t Word OCR Converter can process this task very quickly, and then you can get an editable Word file from scanned PDF file on your computer. If you want to know more of PDF to Word OCR Converter, please go to its official website of PDF to Word OCR Converter from this link: http://www.verypdf.com/pdf-to-word-ocr/index.html. For any concerns on process to convert scanned PDF to Word, you can leave your messages here, we will give you a quick reply. One Response to How to convert scanned PDF to Word? I want scan my bank invoice to TIFF file, and use your software to convert it to word document, do I have to scan my invoice to black and white TIFF file? Is your software support color TIFF file?